The most prominent members of India’s ruling Congress party get rave reviews from the Indian public. Overwhelming majorities have a favorable opinion of Prime Minister Manmohan Singh, Congress party leader Sonia Gandhi and her son and current MP Rahul Gandhi. Opposition leader Nitin Gadkari gets significantly less positive marks. Strong majorities in India express favorable views of the military, the media, the national government, and large foreign companies. Decidedly fewer offer these positive feelings towards the police and religious leaders. 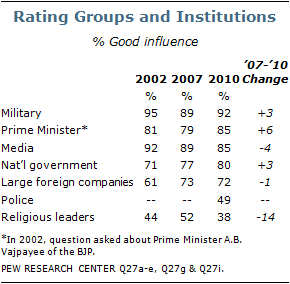 Close to nine-in-ten (87%) Indians have a favorable view of Prime Minister Singh. Moreover, 47% have a very favorable opinion of India’s leader, with only 13% expressing an unfavorable opinion. Singh, who was first elected prime minster in 2004 and then reelected in 2009, is viewed favorably across demographic groups within the Indian population. Meanwhile, the two members of the Gandhi political dynasty included in this survey have similarly high levels of favorability. Sonia Gandhi – widow of assassinated former Prime Minister Rajiv Gandhi – is viewed favorably by 87% of Indians, including 45% who view her very favorably. Her son Rahul also gets high marks, with 85% of the Indian public expressing a positive opinion of him, and nearly half (49%) expressing a very favorable view. 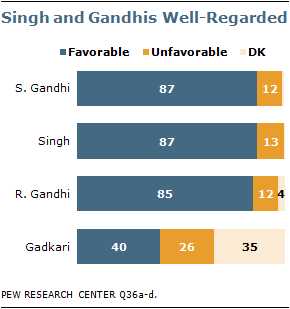 As with Singh, both Gandhis are well-liked across demographic groups. Fully nine-in-ten women view Sonia positively, as do 84% of men; likewise, nearly the same percentage of women (85%) and men (84%) give Rahul favorable ratings. Solid majorities across all age, income and education groups also express favorable opinions of both Sonia and Rahul Gandhi. Nitin Gadkari, current president of the opposition Bharatiya Janata Party (BJP), has significantly lower favorable ratings, partially due to the high number of respondents who offer no opinion. A slim plurality of those surveyed have a favorable view of the politician, with four-in-ten expressing this sentiment, 26% holding a negative view, and 35% not sharing an opinion. The military is seen as having a good influence by over nine-in-ten (92%) Indians; nearly two-thirds (65%) of those surveyed say the military is a very good influence on the way things are going in India. This is the highest level of support among the seven groups and institutions tested on the survey. Those in the higher income category give the military more enthusiastic ratings, with over seven-in-ten (72%) rating the military as a very good influence. Still, majorities (65% and 54%, respectively) in the middle- and low-income brackets share this enthusiasm. At least eight-in-ten in India believe Prime Minister Singh (85%), the media (85%), and the national government (80%) are having a positive influence, and 72% say the same about large companies from other countries. Indians are divided over the impact of the police: 49% say the police are having a positive impact, while 50% say their impact is negative. Women are more likely to have a positive opinion of the police; 55% believe they are a good influence versus 45% among men. Religious leaders are seen as exerting a good influence by only 38% of Indians, with a majority (58%) describing them as a bad influence. Unsurprisingly, those who say that religion is very important to their lives have a higher opinion of religious leaders (41% say they have a good influence) versus those who say religion is either somewhat or not important to them (32%). Opinions of most of these groups and institutions in India have not changed much since the question was last asked in 2007. However, positive ratings for religious leaders are down decidedly, falling 14 percentage points since 2007. On the other hand, ratings for the prime minister have risen 6 percentage points since 2007. And while Indian views on the influence of foreign companies have not changed significantly since 2007, views are up 11 percentage points from the 61% measured in 2002. Pakistani Public Opinion Ever More Critical of U.S.